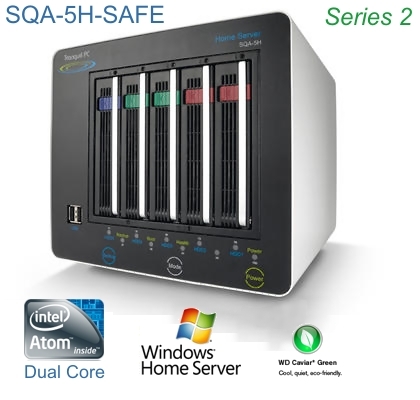 The Tranquil PC SQA-5H-SAFE is not only a quiet machine, it is also a robust file storage server, complete with Tranquil’s innovative Safe Serve Module. Tranquil PC didn’t skimp on the looks, either. The unit construction is made of enameled steel with over 70 percent sourced from recycled material. The system runs on Windows Home Server with an Intel Atom Dual Core processor for speed, power, and reliability. This low powered network storage system features a 2GB memory, 4x spare hard disk drive slots, and a 64 bit ready processor, while using only 22W of power. For cooling, the internal CPU and chipset use an aluminum heat sink (which is fanless). The hard disk drive cooling system includes a hot swap 8cm fan, with optimised speed and acoustic control. The power switch, mode and backup switches, multi-colored LED status indicator lights, and 2 USB2.0 ports are located on the front panel of the Tranquil PC SQA-5H-SAFE. There are 2x 500GB 2.5″ hard disk drives preconfigured on this NAS, set up in a RAID 1 configuration. A three-year warranty, server recovery pack, and a desktop application are also included. Your data is completely safe thanks to the Safe Server Module. Continuous operation is possible even in the event a hard disk drive in the Safe Server Module fails. The process of changing a damaged or broken hard disk drive is easy. Simply identify the hard disk drive that needs to be changed, power-down the server, remove the Safe Serve Module, snap out the hard disk drive module, eject and replace the old hard disk drive, replace the module, and power the server back on. The system will automatically start to rebuild while it is booting. Once all of the LED lights turn green, usually between four and a half and five hours, the system is fully operational. Measurements of this Tranquil PC are as follows: 195 (h) X 213 (w) X 221 (d) including feet. The basic model is available in satin black or gloss white and is being sold for £569.00, not including a 17.5% VAT or shipping. Extra RAM or hard disk drives will add to the price. Interesting hardware, but I don’t want windows. Do they sell it with Linux/samba? Unlikely, so I suggest you take a look at some QNAP systems for a Linux variany. You can get a BBS2 and install whatever takes your fancy ! !